Before HARBINGER WARS 2, Revisit the March Toward Valiant’s First Landmark Crossover in Complete Chronological Order! Valiant is proud to announce the HARBINGER WARS COMPENDIUM – A MASSIVE, 750+ PAGE COLLECTION representing the march toward the original groundbreaking crossover event that collided the opposing factions of the Valiant Universe together for the very first time in an extra-sized, softcover format! 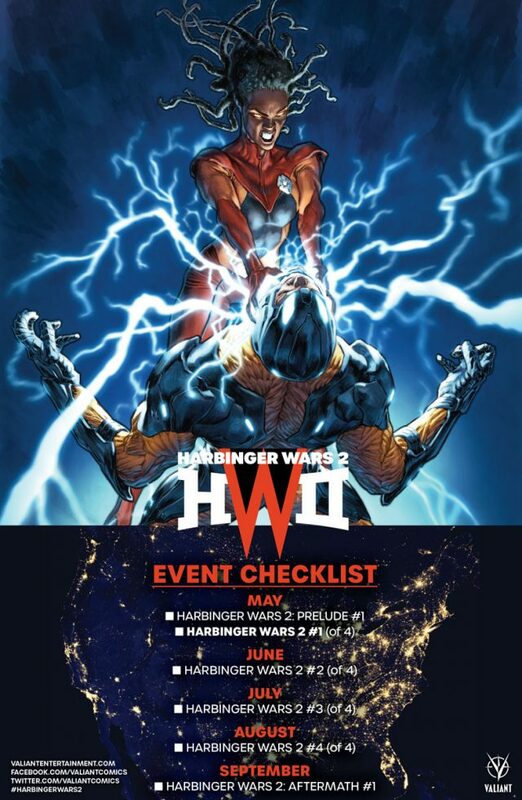 Collecting the entire first years of both HARBINGER (#1-14) and BLOODSHOT (#1-13) alongside the HARBINGER WARS event series (#1-4) in complete chronological order for the first time between two covers, get the whole story behind the definitive Valiant crossover event – just as HARBINGER WARS 2 gears up for an all-out assault on Valiant’s most formidable heroes in May! Featuring critically renowned runs by Eisner Award winner Joshua Dysart (IMPERIUM, Unknown Soldier) and acclaimed writer Duane Swierczynski (Black Widow) alongside a truly all-star cast of artistic firepower – including Clayton Crain (Carnage), Khari Evans (Carbon Grey), Manuel Garcia (Black Panther), Trevor Hairsine (DIVINITY), Clayton Henry (ARCHER & ARMSTRONG), Barry Kitson (Justice League: Year One), Pere Pérez (FAITH), Mico Suayan (BLOODSHOT REBORN), and more – retrace the footsteps of the dueling series that brought Bloodshot, the Harbinger Renegades, and Toyo Harada together for the first time amid the wreckage-strewn fallout of the Las Vegas Strip right here with the oversized and essential HARBINGER WARS COMPENDIUM! 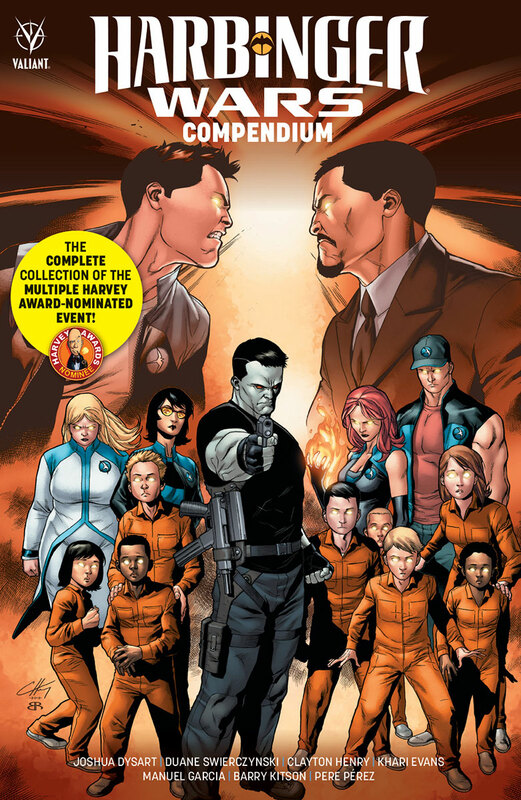 Featuring the first modern appearances of Bloodshot, Faith, Generation Zero, Toyo Harada, Livewire, Peter Stanchek, and dozens more, the HARBINGER WARS COMPENDIUM is the ultimate entry point into the most celebrated superhero universe anywhere on the stands today! 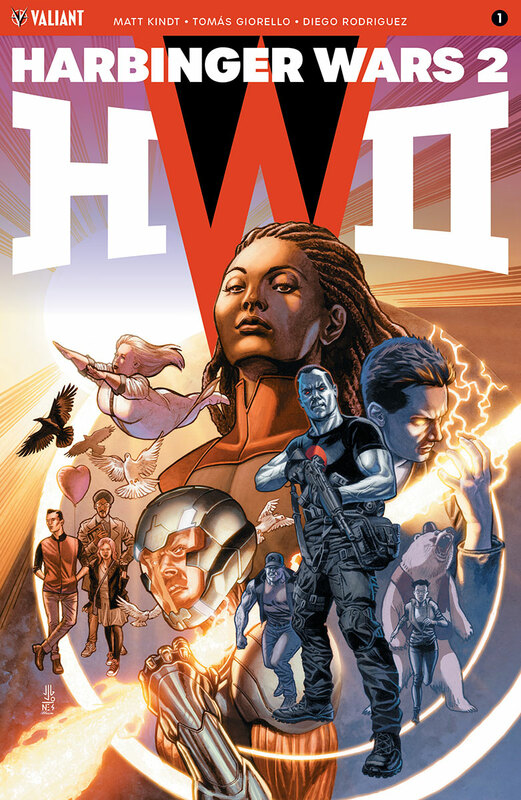 Arriving just in time for the fifth anniversary of HARBINGER WARS’ initial impact, get both the renowned runs of HARBINGER and BLOODSHOT, plus the complete HARBINGER WARS saga, together in one deluxe package on May 2nd! Also coming in May: The most powerful Valiant event ever attempted erupts in full force as X-O Manowar, Livewire, the Harbinger Renegades, Bloodshot, the Secret Weapons, Ninjak, and a cast of thousands draw their battle lines in HARBINGER WARS 2…from New York Times best-selling writer Matt Kindt (X-O MANOWAR, DIVINITY, Mind MGMT), Academy Award nominee Eric Heisserer (SECRET WEAPONS), and superstar artists Tomás Giorello (X-O MANOWAR), Raúl Allén (SECRET WEAPONS), and Patricia Martín (BLOODSHOT REBORN)! 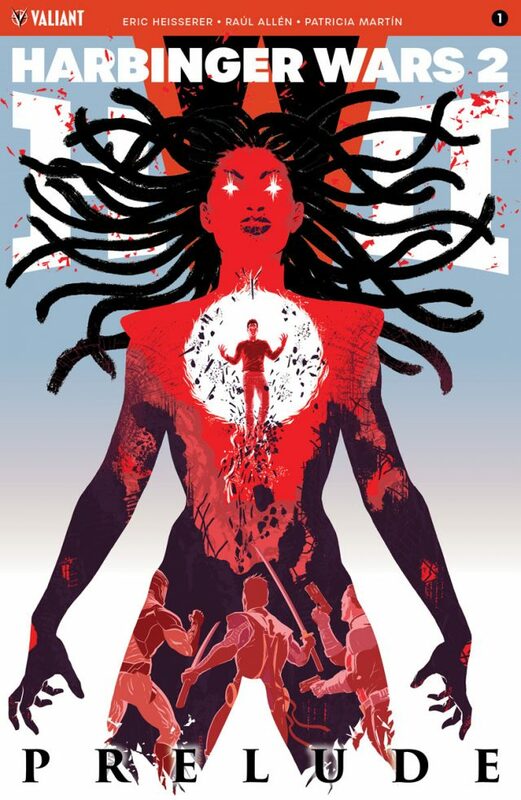 First: On May 2nd, witness the ground zero moment for the future of the Valiant Universe with a startling, self-contained initiation into the senses-shattering clash of 2018 in HARBINGER WARS 2: PRELUDE #1 by Academy Award nominee Eric Heisserer (SECRET WEAPONS, Arrival) and visionary artists Raúl Allén (SECRET WEAPONS) and Patricia Martín (BLOODSHOT REBORN)! Then: On May 30th, Valiant’s biggest and most ambitious event yet takes hold in HARBINGER WARS #1 (of 4) by New York Times best-selling writer Matt Kindt (X-O MANOWAR, DIVINITY, Mind MGMT) and superstar artist Tomás Giorello (X-O MANOWAR, NINJA-K)!